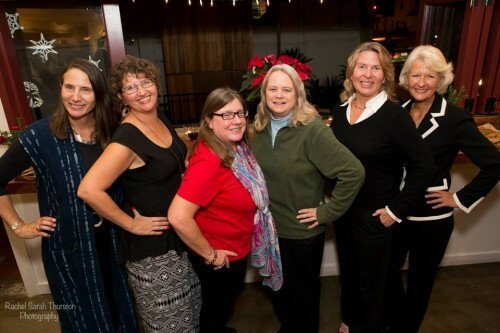 Dimly lit with hints of holiday cheer, C’est Cheese hosted the Annual Holiday Party for the Association for Women in Communications, Santa Barbara Chapter. Members and guests sampled fine wine paired with delectable cheeses, artisan crackers, and other hors d’oeuvres. Every year AWC-SB honors a member of the year and a nonprofit organization. Introduced by AWC-SB’s President, Dr. Minette Riordan, Perie Longo, an exquisite poet, child therapist, and teacher accepted the honored of Member of the Year. When Longo read a poem written by a fourteen year old student of hers, she encouraged her audience to think of nonmaterial gifts they would like to give this holiday season. Longo’s unparalleled talent and humbling presence received applause and questions from eager onlookers. Friendship Center took the honored of Nonprofit of the Year. Friendship Center established itself as a place for adults with Alzheimer’s and dementia to explore their talents. Donations from AWC-SB and guests included art supplies for a new artistic program run by an inspired volunteer. Surrounded by esteemed colleges, laughter and pleasant small talk rang from every corner of the recently expanded cheese shop. 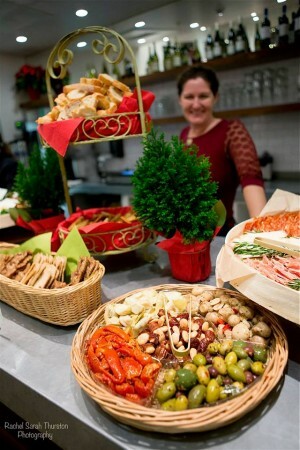 A night spent giving to a wonderful organization, honoring an amazing woman, and indulging in C’est Cheese’s unforgettable food and wine, the Annual Holiday Party opened the doors to a holiday season of giving. This entry was posted in Past Events and tagged Perie Longo on December 20, 2014 by awc sb.